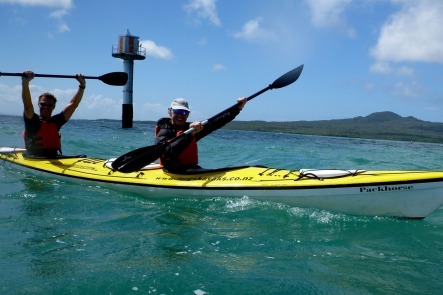 •	After your safety briefing and paddling instruction you will kayak across the Waitemata harbour, meaning 'sparkling waters', where you may see wildlife such as Little Blue Penguins and Cooks Petrels. •	On arrival at Rangitoto Island, which is the largest and youngest of Auckland’s volcanoes, you will start the leisurely 1hr walk to the summit. Walking up the pohutukawa-cloaked island gives you the chance to explore the baked scoria rocks which support over 200 different native trees and flowering plants. •	Upon reaching the top you will be treated to the finest 360 degree views that the Auckland region has to offer. •	If time permits, you might even enjoy a refreshing dip in the sea before the gear is packed back into the kayak to head home. •	BBQ lunch, hot / cold drinks, all kayaking gear, transport from your ship’s berth and instruction / guiding provided. •	City Centre Departure: 8.30am from, Pier 1, Auckland Ferry Building. Return 4.30pm.